Hey there! I'm back from vacation and hopefully back to a more regular posting schedule. 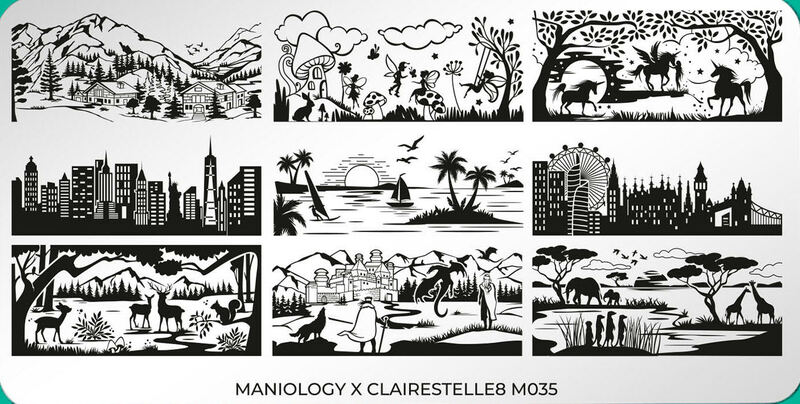 Today I have a review of a collaboration stamping plate between Maniology and the always lovely @clairestelle8. 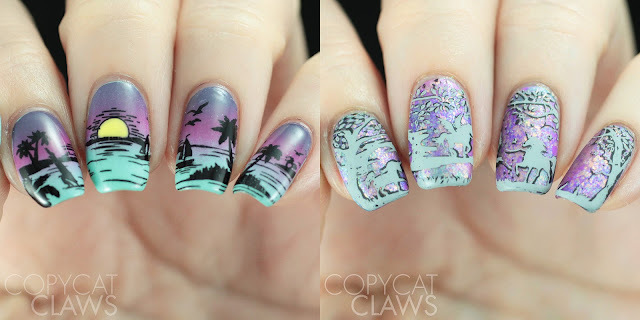 Claire is definitely one of my favourite Instagram nail artists. Her nails are always gorgeous and her captions are always hilarious and she just seems genuinely nice. I was thrilled when I saw a preview of her new collaboration plate, M035. It's full of scenic images that are right up my alley. I've done two manis with it so far but I'm so sure I'll be doing more. 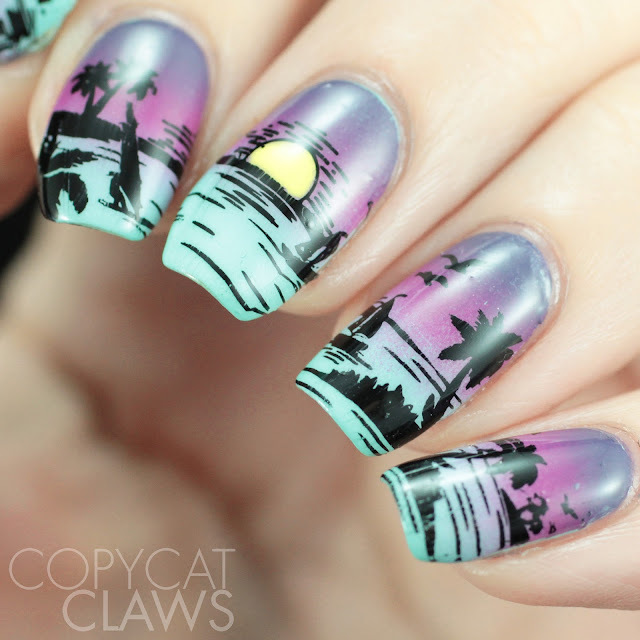 I really should have done a neon one since Claire is famous for her neon manis. I'll definitely put that one my to-do list when I'm caught up on the stuff I fell behind on while I was away. If this plate interests you (and it really should) please use the code COPY10 to save yourself 10% on your order. Check out the scenes on this plate. 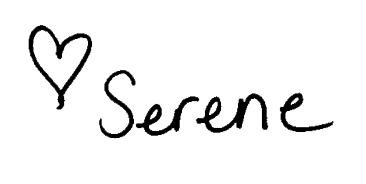 There's a little something of everything from skylines to mythical creatures to nature scenes. I've always loved images like this that can create a story across your nails. It helps that it also has Maniology's etching quality so stamping them is easy. I did these manis before I went to Hawaii but I wish I had actually worn this one on vacation. It is pretty much exactly what I saw while I was there. I did a gradient of Maniology's Tranceland, Tulip Julep and Sassy as the base and then stamped with Mundo de Unas Black. On the middle nail, I did do reverse stamping so I could color in the yellow sun using Nikko. I finished it off with Vibrant Vinyls top coat. 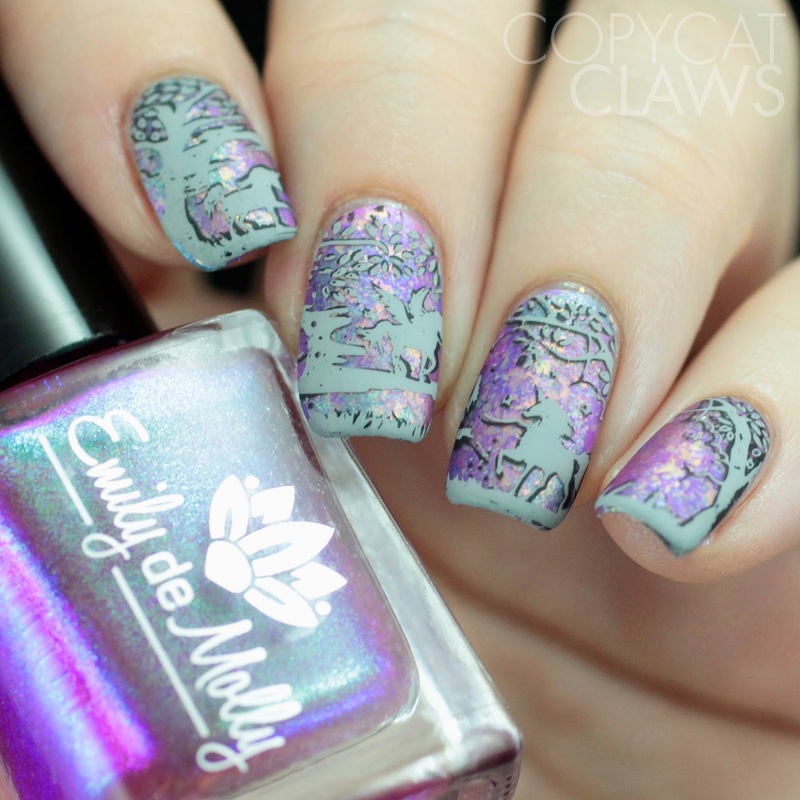 For the second mani I wanted to use the unicorns and pegasus. I started with 2 coats of Emily de Molly Undertones and then sponged on bits of Sea of Lies, Save Your Boredom, The Uttermost and Parallel Worlds. Then I added a coat of Color Club Snow-Flakes before double stamping with Mundo de Unas Black and Light Grey and finishing with a matte top coat. 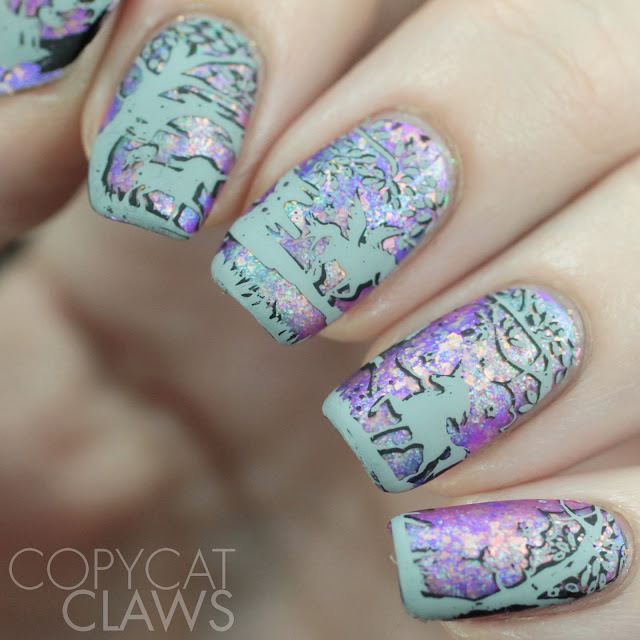 In retrospect, I should've used white instead of grey so the stamping would've popped more. An image this pretty deserves to stand out. I really hope you like this plate as much as I do. 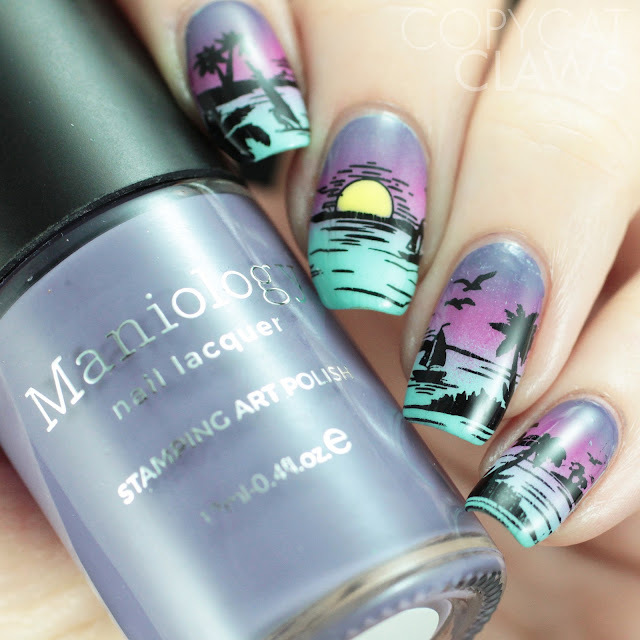 I'm sure I can't be alone in liking scenic manis. I'm expecting to see some Game of Thrones manis coming up with that bottom image as we approach the final season of the show! I might even have to do one myself.